Introduction: Plasma cell-rich rejection is a distinct histological phenomenon associated with poor renal allograft outcomes. Aboriginal and Torres Straight Islander (ATSI) transplant recipients have poorer allograft survival and higher rates of acute rejection. We sought to determine whether a higher incidence of plasma cell-rich infiltrates (PCIR) could account for poorer survival. 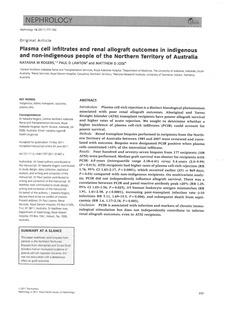 Methods: Renal transplant biopsies performed in recipients from the Northern Territory of Australia between 1985 and 2007 were reviewed and correlated with outcome. Biopsies were designated PCIR positive when plasma cells constituted >10% of the interstitial infiltrate. Results: Four hundred and seventy-seven biopsies from 177 recipients (108 ATSI) were performed. Median graft survival was shorter for recipients with PCIR: 4.0 years (interquartile range 2.18�41) versus 5.4 years (2.0�99) (P = 0.013). ATSI recipients had higher rates of plasma cell-rich rejection (RR 1.76, 95% CI 1.43�17, P < 0.0001), which occurred earlier (251 vs 869 days, P = 0.03) compared with non-indigenous recipients. On multivariate analysis, PCIR did not independently influence allograft survival. There was a correlation between PCIR and panel reactive antibody peak >20% (RR 1.29, 95% CI 1.03�56, P = 0.025), 5 human leukocyte antigen mismatches (RR 1.91, 1.41�58, p < 0.0001), increasing post-transplant infection rate (>10 infections RR 5.11, 1.69�.5, P = 0.004), and subsequent death from septicaemia (RR 1.6, 1.17�18, P = 0.003). Conclusion: PCIR is associated with infection and markers of chronic immunological stimulation but does not independently contribute to inferior renal allograft outcomes, even in ATSI recipients.